Lately I've been painting cows. 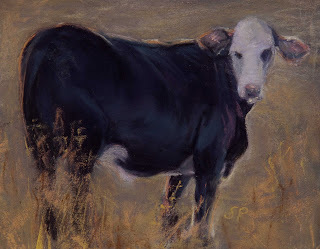 I know some of you will look at this one and say, hey, that's not a cow, it's a male. 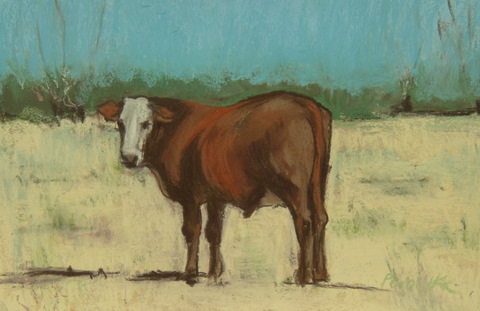 Okay, then, I've been painting cattle. But I like the word "cows" better than the word "cattle" and after checking with several sources--including the Oregon State Extension service--I think it's okay to use the colloquial term, cows, to refer to this group of animals. I really liked the way the setting sun sparkled on both the field and his silhouette. The next image, "Who, Me?" was selected by the winner of my recent drawing and is no longer available for sale. I've got another cow on the easel and will post it sooooon.